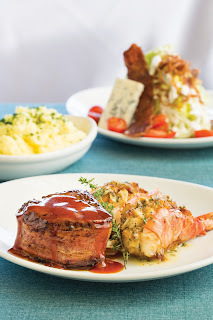 Two-course prix fixe menu at Flemings - Priced right for a night out! There's no denying that our favorite date night out is at a nice steak house but be honest, most of the time, it will cost you a pretty penny. We have cut back on the amount of dinners out since we are saving for a really expensive big party also known as a wedding. Luckily for us, Fleming's Prime Steakhouse is offering a two course prix fixe menu for $32.95 and at that price, you will not break the bank! I have to say, I was pretty amazed at this price point - a 8oz filet mignon and crab stuffed shrimp for less than $35 a person....it was pretty amazing. This special is available by online reservation only and you will not find this special on the menu. The Filet and Shrimp special is available until September 30th so make sure you take advantage before it is too late. STARTER COURSE French Onion Soup or The New Wedge Salad. I opted for the french onion soup while my dinner companions, Chef Judy & Tracy ordered the wedge salad. Flemings french onion soup was out of this world and the girls really enjoyed their salad. ENTRÉE Filet Mignon wrapped in bacon with Crab-Stuffed Shrimp lightly topped with a spiced crumb crust with a side of Mashed Potatoes. This steak was cooked to perfection and was full of flavor. Although I am a bacon girl, I usually do not like bacon wrapped anything - but I make an exception for Fleming's 8oz filet. For $32.95, you cannot beat this deal. Also, keep in mind, you can order any of the wines Fleming's offers by the glass as "big pours". It's a glass and a half of wine vs. a normal pour. I enjoyed a large glass of MacMurray Ranch Pinot Noir with this dinner which was the perfect pairing for my palette. This is one of the best deals I have seen Flemings offer over the past year. Absolutely worth the trip! If you want to take advantage of this special, click here to be taken to their online reservation page. What is your favorite place to spend a night out with a loved one or friends? What do you splurge on?